African elephants (the savanna elephant, Loxodonta africana africana, and the forest elephant, Loxodonta africana cyclotis) are found in 37 countries in the continent, with the savanna elephant distributed over eastern, southern, and western Africa and the forest elephant confined to central and parts of western Africa. 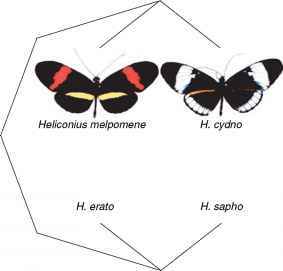 The distribution map (fig. A1.2) and the population estimates (table A1.2) are taken from the database of the IUCN/SSC African Elephant Specialist Group, which can be accessed on the Web at http://iucn.org/themes/ssc/sgs/ afesg/aed/aed98.html. 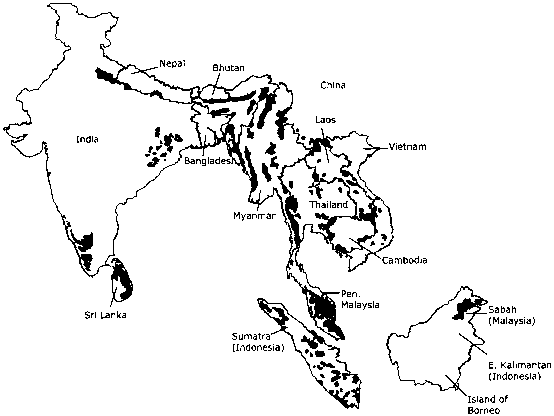 Distribution of Asian elephant populations. Distribution of African elephant populations. 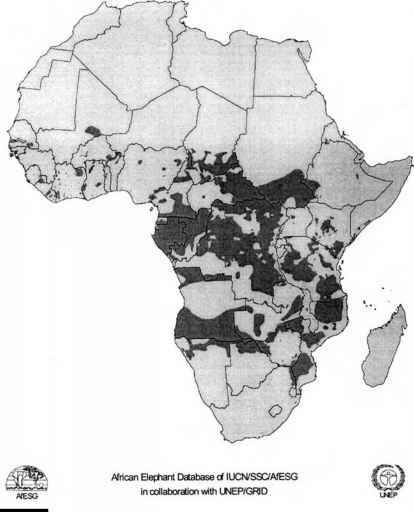 Summary of African elephant estimates on the continent (1998).